So you have just arrived in Barcelona and you are ready to do some exploring? The single best way of doing this is via the Barcelona Metro system. Its array of inter-connected lines offer you the opportunity to get within comfortable walking distance to, well, pretty much everywhere in the city! To buy a ticket you will need to approach one of the large, red, touch-screen machines armed with a credit/debit card or cash. Just a small point, beware of using large notes when paying for a ticket. The machines will only dispense coinage as change. Many a ‘newbie’ are left with a ton of €1 coins when paying with a €50 note! There are a few options for you here and all of them are available from the Metro’s automatic vending machines. Children under 4 travel free on Barcelona metro as well as on buses, FGC trains and trams. 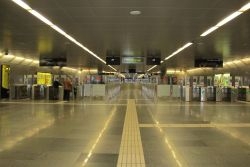 Take a look at our Barcelona Transport System Tickets page for more options. Saturdays and the day preceding 01/01, 24/06, 17/08 and 21 to 24/09: 24h Service. 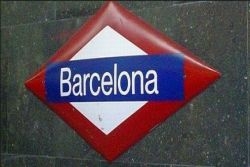 On December 24th the Barcelona Metro Closes at 23:00. 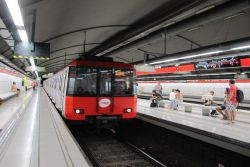 The Barcelona Metro consists of 8 separate lines which are inter-connected at various stops (or stations) around the different districts in the city. Each ‘línia’ (Catalan for Line) has its own distinguishing number and colour. You will notice that each particular station is colour coded to make this nice and clear! Metro stops are indicated on street level by lampposts with big red M’s on them. You might also notice a similar lamppost with an orange logo above. These are indeed ‘underground trains’ yet they are different to the Metro system. 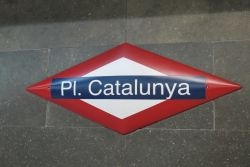 The orange signs indicate Barcelona’s FGC train system which also operates below Barcelona’s bustling streets. The two systems do inter-connect at various stations and serve different districts of town. It is commonly the case that whatever transport ticket you purchase, you will be able to use both systems with the same ticket. 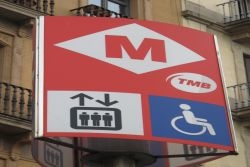 The Barcelona Metro is fully wheelchair accessible as well as prompt, reliable and easy to use! Ensure that you have worked out a route on the wall-maps provided (or take a free leaflet map which are available at most stations) and head towards the electric barriers. Insert your respective ticket into the slot and ‘open-sesame!’ You are now ready to explore. Each line has trains which run in opposite directions and you need to ensure you head to the correct platform. The stops corresponding to your train’s direction are displayed on the wall en-route to the platform. When the train approaches it will come to a stop and it is important to remember that it is your job to open the doors via either a button or handle. The doors do not automatically open and likewise, this is the same when the train comes to a stop at your destination station. KEEP YOUR TICKET even if it has run out of journeys. Some stations require ticket validation when you are exiting. If you cannot provide a valid ticket to an inspector or machine you may be subject to a whopping fine! Keep away from the edges when you are on the platforms. Keep an eye on the ‘light-up’ route maps which are above the train doors and automatic announcements. They indicate when you should be getting ready to leave the train. Pay attention to a red light inside the carriage that will indicate on which side the doors will open. 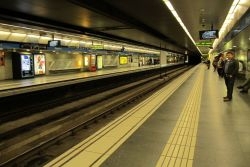 Is the metro in Barcelona safe? The Metro is safe, clean and reliable, yet it does come with a pickpocket every now and then. Do not give them an opportunity, so the best thing to do is move your wallets and purses to an inside pocket and keep a firm hand on your bag/rucksack or camera in front of you when travelling on busy trains. Plan your journey here and enjoy the ride! Click on the Metro map here below and check what metro stations are in your area.